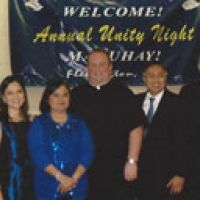 The Filipino-American Association of St. Magdalen’s (FASTMAG) is a faithful and dynamic group of over 100 parishioners of Filipino descent, who are dedicated to Christ and supporting the mission of his Church. Deeply rooted in the rich Catholic ethos of the Philippines , FASTMAG brings to our parish the vibrant and unique spiritual customs of their island nation. 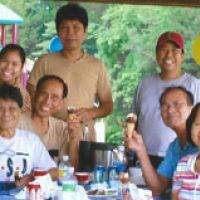 FASTMAG is one of our parish’s most generous donors of time, talent and treasure, steadfast supporters of our pastor and our parish’s mission to heed Jesus’ call to “Come and follow me.” FASTMAG is part of the Diocese of Metuchen Commission for the Filipino Apostolate (DMCFA). FASTMAG was formed in 2003 at the request of Fr. Tim, our pastor, and placed under the spiritual guidance of then parochial vicar Fr. Joey Cervantes, a native of the Philippines. 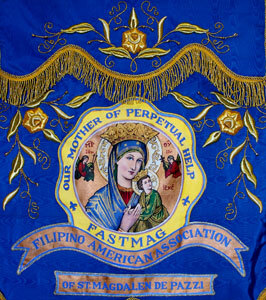 Under the careful oversight of ten elected officers from St. Magdalen’s Filipino community, the association’s first and most foundational contribution to our parish was the introduction of the weekly Novena to Our Mother of Perpetual Help, a popular Catholic devotion which began in Europe in the 14th century and spread throughout the world, taking especially firm root in the Philippines. This powerful devotion to Mary has become a unifying spiritual anchor at St. Magdalen’s and undergirds all of the meaningful work FASTMAG does for our parish. FASTMAG’s jubilant faith and welcoming spirit are an attractive public witness to the power of Jesus’ presence in their lives! 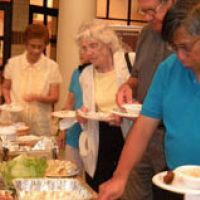 FASTMAG also regularly provides traditional Filipino refreshments at parish wide celebrations including the Weekly Novena to Our Mother of Perpetual Help, the Feast of Corpus Christi, 40 Hours of Eucharistic Adoration, and St. Magdalen's annual Music and Food Fest. Since its inception, FASTMAG has played a significant role in helping to bring parishioners closer to Christ through their support of the sacramental life of the Church. Their consistent participation at daily Mass, Eucharistic adoration, the various feast days, and devotional and social activities of the parish is a living embrace of Jesus’ intimate invitation into communion with him. In addition, just as Catholics throughout the centuries have built the resplendent cathedrals of the world through their generous donations and humble hands, FASTMAG’s fund-raising efforts and significant donations have helped build our Spiritual Formation Center, enhance our liturgical celebrations, and bring sacramental beauty into our Church. For over one thousand years, Christians, realizing that Jesus is truly present in the Eucharist, have been drawn to adoration of him in the Eucharist even outside of Mass. The Monstrance is the sacred vessel used to show Christ in the Blessed Sacrament to the people for adoration and prayer. 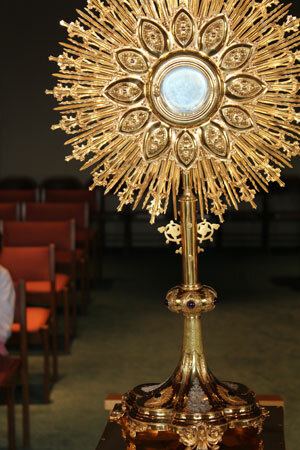 This monstrance was crafted in 1912 and donated in celebration of the Year of the Eucharist. In the liturgy (Mass), all the sights and sounds should remind us of our glorified heavenly future; all the brokenness of this world will be healed and perfected in heaven. 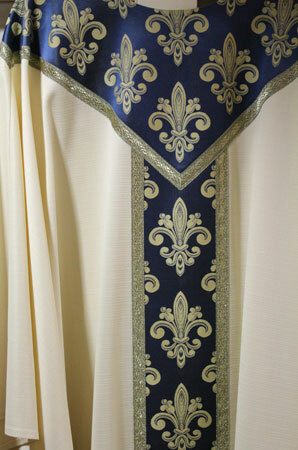 So the priests do not wear ordinary clothing in the Mass, but elaborate, ornamented, festive garments called vestments to remind us that in the liturgy we participate in this heavenly reality which is “here but not yet.” Blue is the traditional color for the Blessed Mother- the chasuble, pictured here, highlighted with blue and gold is used for celebrations of the Blessed Virgin Mary. The General Instruction on the Roman Missal directs that a crucifix should be displayed prominently in the sanctuary of every Church. Although the liturgy is the celebration of Jesus’ resurrection, the crucifix is a powerful sacramental sign, reminding us that in order to be raised up with Jesus to heaven, we must also convert our lives, take up our crosses, and share in Christ’s passion. 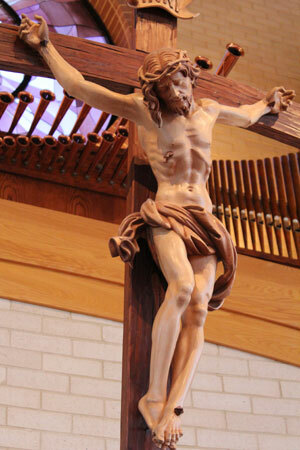 This magnificent crucifix which graces our sanctuary was hand carved in Italy. 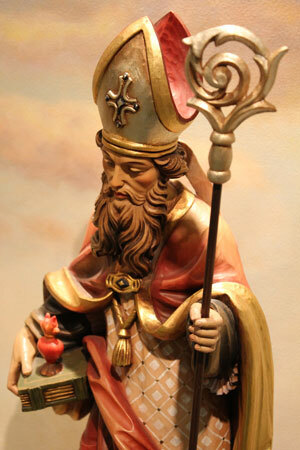 This hand carved statue of Saint Augustine is one of the many sacred statues displayed in our Spiritual Formation Center. Throughout the year, as our CCD students walk the halls and enter classrooms, they are surrounded by images of heroic saints, inspiring them to strive for holiness. Every November, these statues are displayed in the Church for All Saints Day, a reminder that God calls each one of us to sainthood. This sacred icon is a beautiful copy of the original which was painted in the 14th century. For over 500 years, Catholics have flocked to images of Our Mother of Perpetual Help seeking her intercession and maternal guidance. Saint Francis of Assisi is credited with creating the first nativity scene in 1223. Inspired after taking a pilgrimage to the Holy Land, he created a nativity hoping to draw his community into the splendor of the incarnation. 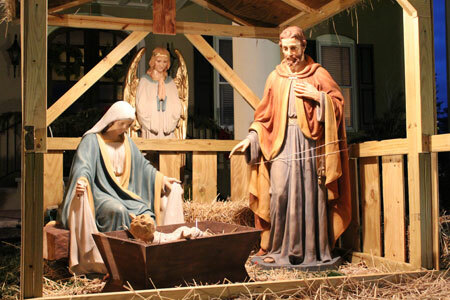 We are blessed to have a radiant full size outdoor nativity scene of our own which invites all who visit our campus during Christmas into a deeper connection with the baby Jesus. 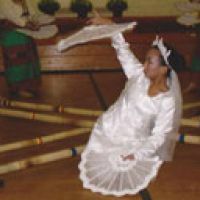 A Filipino Mass every four months using the various local dialects and highlighting the diversity of the Philippine language. 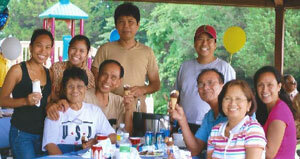 FASTMAG also helped form a Filipino choir, to enhance these liturgical celebrations. Simbang Gabi, a devotional nine-day series of Masses in honor of the Blessed Virgin Mary in anticipation of the birth of Christ. Each year, FASTMAG, sponsors an evening. 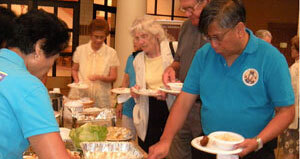 FASTMAG members join Bishop Paul T. Bootkoski at the annual Feast of San Lorenzo Ruiz de Manila. A missionary in Japan in the mid 17th century, Lorenzo suffered great persecution. Under extreme torture and the threat of death if he did not renounce his faith, the Philippine native declared, “"I am a Catholic and wholeheartedly do accept death for the Lord; If I had a thousand lives, all these I shall offer to Him."